DaniWeb recently reported how Apple had won a ban on the sale of the Samsung Galaxy Tab 10.1 tablet in Europe and even published the rather generic-looking design drawings at the heart of the case. Now a Düsseldorf regional court judge, Johanna Brueckner-Hoffmann, has heard the Samsung appeal against the ban and concluded that the Galaxy Tab 10.1 gives a "clear impression of similarity" to the iPad: the result being that the ban has been upheld, but only in Germany rather than being across the EU. If reports are to be believed, Samsung could fight back with an attempt to delay or block the sale of the new iPhone 5 in Europe (on the grounds that it infringes some basic technology patents held by Samsung) before it has even arrived. 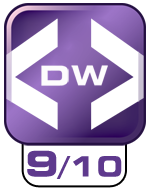 DaniWeb has got hold of a Galaxy Tab 10.1 tablet device to see what all the fuss was actually about. Our immediate impression after taking it out of the box was a simple 'wow' at just how thin and light the Galaxy Tab 10.1 actually was. At just 256.6 x 172.9 x 8.6mm it is slimmer than the iPad 2 an at 565g it is lighter as well, and this is crucial when it comes to a large tablet device such as this. Let us explain, although some users with arms like Popeye will doubtless disagree, when holding the iPad 2 for any great length of time there is more than a small degree of discomfort that enters the equation due to the weight. Now the Galaxy Tab 10.1 weighs in at 565g compared to the 613g of the iPad 2, which doesn't sound a lot but it certainly feels it. The Galaxy Tab 10.1 is actually just light enough to be perfectly comfortable for extended one handed holding. That is something which we have not been able to say about any other compatible, in terms of screen size, tablet so far. The soft feel of the rubbery-plastic backing might put some off when compared to the slick metallicness of the iPad 2 but, in actual fact, it contributes to the comfort factor by aiding grip. Don't let the use of the word 'plastic' put you off here either, there is plastic and then there is high quality plastic material that contributes to an high quality of overall construction, and a surprisingly large dose of attractive look and feel. The bit you look at, the screen area, has a glossy black bezel and the rear-facing camera is enclosed within a silver strip while everything feels sturdy and soft at the same time. If you are worried that holding a Galaxy Tab 10.1 would make you look somehow inferior when sitting next to an iPad user, don't; there is nothing inferior about this tablet in terms of construction or desirability. But size isn't everything, the screen is. Think about it, a tablet is pretty much just a screen with some sockets dotted around the edge. Luckily the Galaxy Tab 10.1 doesn't disappoint in terms of the truly brilliant 10.1" 1,200 x 800 multi-touch LCD that provides more screen estate than the iPad 2 and is even sharper in terms of dot pitch as well. Seriously, this has to be the best screen we have had the pleasure of using on a tablet device so far bar none: brighter than the iPad at 494cd/m2 and the contrast ratio of 600:1 doesn't hurt either. Nor does the inclusion of the proprietary Samsung 'Plane Line Switching' (PLS) technology which delivers what it promises, and that's really great viewing from just about any angle you care to squint at it from. 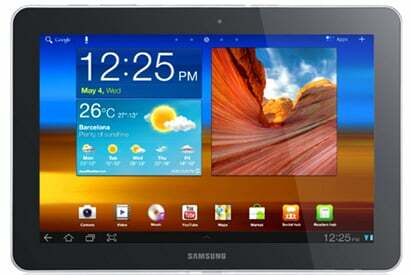 The Samsung Galaxy Tab 10.1 is, without any shadow of a doubt, the best Android-powered tablet to date. In fact, it's even better than the iPad 2. There, we said it. Let's just hope that all the design and patent silliness gets sorted so that consumers everywhere can discover that there is life outside of Apple when it comes to truly stunning tablet devices. To address the apps issue, as someone sent me a PM about this, I did mention in the cons section that Android still lags behind iOS when it comes to available apps. I didn't mention it in the review as that's hardly a secret - but it does not make the Galaxy Tab a 'dead duck' as I was informed, nor does it make the review 'null and void'. There are less apps for the Galaxy Tab than there are for the iPad 2, agreed. However, that is not the same as there are no apps for the Galaxy Tab, or even there are no decent apps for the Galaxy Tab. well that´s plain wrong. The German court ruled that they have no jurisdiction on banning the Samsung in Europa so they ruled that Samsung (Germany) may not distribute it in Germany. This however in no way bans the SALE of it within Germany, as retailers may buy it from another Samsung branch (Samsung Netherlands, Samsung France ect) and sell it inside Germany. Mediamarkt already stated that they will continue to sell the Samsung Galaxy Tab in Germany. Actually, as stated in the original article "The Dusseldorf District Court in Germany has awarded a preliminary injunction in favour of Apple which, get this, bans the sale of Samsung Galaxy Tabs throughout the European Union (with the strange exception of the Netherlands where a separate court action is underway). Customs officials have apparently been given orders to seize shipments of the tablet, and tens of thousands of them are understood to have been seized so far today". On August 9, Samsung was issued a preliminary injunction on sales and imports across Europe, with only the Netherlands exempted, which could specify fines of up to $350,00 per violation and imprisonment of Samsung’s management if infringement was seen to be being continued. According to reports, the Düsseldorf court where the injunction was granted has a reputation for being the German equivalent of the United States’ East Texas courts when it comes to fast-tracking patent infringement cases. The European injunction was lifted after the court said it was not aware of its jurisdiction across Europe, revising its ruling to ban imports and sales in Germany alone. However, the German version of the tablet will be banned across Europe. Well this is absolutely disgusting. Im not a big mac fan to being with so call me a "android fan boy" if you want, but I believe apple was getting angry that Samsung tablet was so competitive with the iPad. Im not going to lie, the Ipad is a nice and impressive piece of equipment but it not for me or everyone. Kinda like the same reason why people drive different vehicles. I like tweaking and playing around with a customizable interface. I pad is pretty much stuck a bunch of icons in a grid. These arent the only reasons but I like android over the ipad os anyday. Totally agree, I don´t see car manufactures sue each other because another MPV or pickup looks like theirs. The form of every tablet (including those that came before the iPad) is the same as it´s dictated by the form of the screen and it actually defines whether or not it´s called a tablet. When first saw the the registered design drawings at the heart of the Apple/Samsung dispute I have to admit I thought it almost inconceivable that such a generic and simple set of drawings could have been granted protected status in the first place. Then again I readily admit to being in a permanent state of disbelief when it comes to the whole technology patent arena, broadly speaking. Remember when Microsoft won a patent on what was, essentially, the PgUp/PgDn process? Not a chance android lacks on the app side of things. Apple is crappy since you have to pay for most of the basics apps out there. Pathetic. Pathetic.. Apple and Microsoft, both, are burning consumers, vendors, and any company in their way for the sake of short-term money... just wait till that bullet comes back to bite you!! The Galaxy Tab is an innovative product that constitutes competition to Apple, and apparently here in America it's okay to kill your competition without competing... I'm surprised that the EU allowed this as Tab is a demonstrably superior device with its own unique technology!!! Very, very disappointing!! Apple has burned too many of its own bridges!! Samsung IS actually one of its hardware vendors, a big one too!!! Way to go Apple!! Samsung may not be one of the primary Apple hardware vendors for much longer though, the grapevine suggests that Apple is actively investigating alternative sources for the components currently supplied by Samsung. Of course, the grapevine is often wrong, but in this case, and given the bad blood that's developing, it would seem to be an obvious strategy. I have to agree with this verdict. I recently bought a Galaxy Tab 10.1 and I am absolutely glad I waited as long as I did. I also don't believe Apple have a case against Samsung on this matter because, if as they claim in Australian the Galaxy Tab was hurting their sales due to what the German Judge called the ordinary person on the street not being able to tell the difference between both the ipad and the galaxy Tab, I can for one tell Apple that I was NEVER going to buy any of thier mobile devices for the very simple reason that that I can never help but feel like I am being some how ripped off if I were to buy one. To understand my point remember when the ipad came out, we were told the rear camera was not needed, "...who in their right mind would take pictures of shoot videos with a tablet? The form factor is all wrong!" Yet not a year later and we get the socalled pointless camera showing up on the ipad2 did we not? And rumour had it that the ipad3 was going to sport a feshy litle led flash for that same idiotic and useless camera! It was the same thing with the iphone! When that was released despite most 3g phones at the time having the front facing camera (i.e. the one that points back at you) the iphone did not and not just that it didn't it was limited to selected carriers which generally were the most expensive mobile phone/wireless service providers in all the countries the iphone was launched in. It wasn't until I believe it was the iphone3 that Apple decided the camera would be included. Then there is the issue of flash! Yes flash may, drain your battery, yes it may be an old and outdated technology, but it works, its cheap and convinient and ultimately most websites use flash. Moreover, it is my money I am spending Apple are not doing me a favour by selling me the ipad. So it is up to me to decide if I want to view flash sites. It is not up to Apple to tell me what I can or can't view on the device I paid for and in no concievable way am I renting or can they not decide to suddenly stop supporting. And that's the thing Google did well with the Android OS, they gave us the consumers the choice of weather or not to open flash images on websites. If I want to view flash on my Galaxy tab I have to tap on the download arrow to have the images load up. Apple and their users always talk about the Apps on itunes, but seriously, how many of those 1000s of Apps does any one person use? Besides, most of the premium apps on itunes are also available on the Android Market. For instance a recent Apple ad said if you didn't have an Iphone 4g you could not do airpaly and stream from your iphone to your TV or audio system or other devices. Well that's a HUGE LIE!!! The same company that made Airplay also makes DoubleTwist and AirTwist which does exactly the same thing for Android devices. The Apple adds show you 3d human skeletons presumably from medical study apps, well the same or similar apps are available on Android. So what would I like to do on the go do I have to have an Apple device for? Absolutely nothing. Apple lost me as a potential buy of their devices a long time ago and I was not going to spend that kind of money on an ipad. So given I was not going to buy Apple or Windows, even if Microsoft appear to have gotten their act together, given my previous experience with the windows mobile OS, I was left with Android and a choice of very much similar tablets interms of their insides. This is where it simply boiled down to the looks and feel of the various devices. Motorola had lost their way for some years now so I wasn't going to get the Xoom especially given how heavy it felt. The Asus was very nice but still there was something about it that just didn't feel right to me, the Acer also has something of a bulky feel to it and the Sony is just ugly even though they tried something clever and shaped their tablet in the form of a folded book. It just didn't pay off! So it came down to the Galaxy Tab. yes a bulkier tablet may be easier to hold but my tablet was alway going to go in a protective case and be covered with a screen sheild to prevent damaging it. So I thick tablet means an even thicker case. Also before I bought it, and being as anally retentive as I can be at times research is normal for me when buying things above $50, I did my research on the asseccories that would come with the various devices. And once I knew there was a valid reason for not including the internal SD card reader (i.e. reading the card means more cpu use which means reduced battery life) and that Samsung sold an external microSD and SD card reader adaptor for the 2nd gen Galaxy Tabs. And not just that I could find them online and on eBay, I decided to buy my 10.1. Yes it may have a similar shape a to the ipad but its internals are much better, being Android I can customize the UI to my personal style, it opens and edits my xlsx and docx files and I don't feel like I have missed out on anything. If and when Samsung release the 3rd gen GalTab, I can rest easy believing it will be because of an actual improvement in technology not because they left something out on purpose that they could easily have included in the 2nd gen GalTabs. I can't say with any confidence that I would feel this with Apple's ipad. Sorry for the essay but I just get so passionate about this whole Apple and Samsung and other Android device things...more so about my dislike of Apple's marketing tactics and the icult they seem to have created wit hpeople seemily brainlessly buying into everything they say. That is not to say they don't have good designers especially since I liked their bluetooth magic kebaord and track pad so much I found a way to use them with my HTPC. When it comes to there computers and mobile devices, I just don't know. Great collection of features and the Nvidia chip is certainly a good addition. It might really stand as a compitator. To me the weight of iPad2 does'nt matter a lot when it comes to the quality of the gadget. I have worked on both, iOS and Android. I personallly feels Apple's iOS is better. If we talk about the apps available over the market, iTunes offer greater amount and better quiality apps. In terms of services you can always switch your device from previous model to the latest one by paying some amount, Android tabs and cell phones does not provide such facility. So what i think is iPad tablet is better than Galaxy and other Android OS tablets. The Samsung that you are referring to, my friend has that tablet and he loves it! I'm an Android user and based on the customizations that the Android platform offers, vs the plain same old been there done that UI that all the iDevices seem to have, I would say the Samsung Galaxy Tablet will be the better bet. I plan on getting the Samsung Galaxy Nexus on Verizon in November when I am eligible for upgrade. Hey john29 if you look at the price no doubt Samsung wins but if you go through the functionalities and smoothness of the OS, Samsung tablet is nowhere near to iPad 2. Hmm mantaining Apple is an expensive task to do as it requires bulk apps for each n every function. i dont know which one is better but apple issued this because Samsung was a threat to it. Samsung's latest Android tablet looks a lot like an iPad 2 - so much so that Apple has called foul. Now that the court injunction has been lifted, we examine how the former outlaw measures up. After months of legal wrangling, the Samsung Galaxy Tab 10.1 can finally be legally sold in this country. The Federal Court of Australia has unanimously overturned an earlier interlocutory injunction that had barred the tablet from sale (read the full story here). Now that you can actually buy the device, we thought it was time to run our review. In short; it's the slickest Android tablet yet. At last the iPad 2 has, almost literally, met its match.